Violinist Ruth Bergman is a dedicated teacher and a seasoned performer. With over ten years of teaching experience, she has held positions on the faculty of nationally respected Suzuki programs, including the Hartt Community Division in Hartford and the MacPhail Center for Music. Ruth has also taught as a guest at Western Springs School of Talent Education and the Augsburg College Suzuki Talent Education. She is an active member of the Suzuki Association of the Americas (SAA). 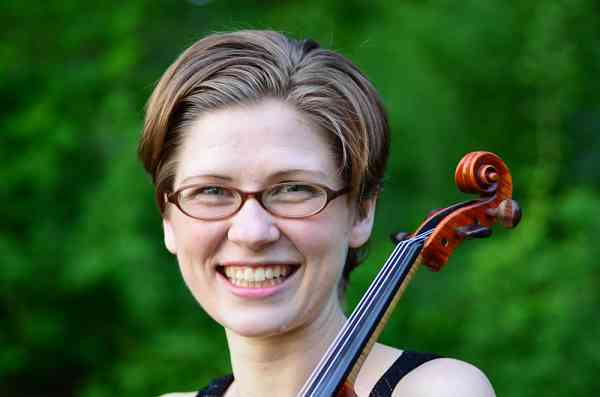 Ruth holds a Bachelor of Music degree in Violin Performance and a Master of Music degree in Violin Performance and Suzuki Pedagogy from The Hartt School, with additional collegiate studies at Lawrence University. She has long-term violin pedagogy training with Teri Einfeldt and Suzuki Early Childhood training with Sharon Jones. Other influences on Ruth’s teaching include Diane Slone, Melinda Daetsch, and Kathy Wood. A passionate advocate for Suzuki Early Childhood Education (SECE), Ruth is gaining a strong reputation for her work with the youngest students in the Suzuki community. Ruth has undertaken two levels of SECE training, has taught Suzuki baby classes in several programs, and now has also experienced these classes from the parent perspective. She deeply believes in the mission of the class to teach musical, language, and other life skills through the creation of a positive, nurturing environment. Ruth enjoys applying aspects of the SECE curriculum to her work with very young instrumental students. As a performer, Ruth has a diverse experience, ranging from symphony orchestras to musical theater. She especially enjoys collaborating as a chamber musician and is interested in Baroque performance practice.. She has performed with the Hartford Symphony, Eastern Connecticut Symphony, Fox Valley Symphony, the Bishop String Quartet, and Rhymes with Opera, among many other ensembles. In 2012, Ruth and her sister, cellist Leah Bergman, toured five States, giving eight recitals across New England and the Midwest. Her primary teachers have been Katie Lansdale, Anton Miller, and Allen Ohmes. Ruth lives in Minneapolis, MN with her husband, their baby daughter, and cat. She enjoys mini golf, cooking, board games, and spending time outside.